Is Tape the best Product for an Electric Fence for Horses? Tape in its basic widths of 20mm or 40mm have been the product of choice by a majority of horse owners since their introduction on the market in the 1970's. Their popularity was initially enhanced by the history of horses getting caught in plain wire and barbed wire fences with their attendant trauma. The tape was superbly marketed as a solution to the perceived poor visibility, and inability, of horses to "see" plain wire and has dominated the conductor market ever since. This product all but dominated the market until the thicker 6mm rope was introduced and still occupies the dominant share of the market. Scientific analysis of horses eyesight has been carried out in recent years showing clearly that horses have a greater ability to "see" than humans and that the idea that tape was superior was a figment of human perception. I have personally watched horses look at a fence then push through it – fortunately without getting tangled. Occasionally horses (and other animals) will get tangled and require more effort to get through and hopefully breaking the conductor. THIS is where a horse may get entangled and damaged – not because they failed to see the fence in the first place. Unfortunately animals do not have the human dexterity to be able to extract themselves from entanglement. The width of the product acts as a sail in the wind and will flap madly - the stronger the wind the more accentuated this is. This is particularly evident with the wide 40mm tapes but is significant with the narrower tapes. The constant bending back and forth results in the cyclic application of a load to the small filaments causing them to fracture and break. The image shows a cross section under magnification - the dark area showing gradual deterioration until the breaking point is reached when the filament then breaks as shown under microscope view in this image. These are two examples of the effect of wind on a tape. Tape Vibrating in an Insulator. Typically wind damage will be noticed at the insulators, particularly where the tape has been clamped tight resulting in a fulcrum about which the tape may flap back and forth. The picture left shows the filaments in both tapes, top and bottom, are broken at the insulator visible in the blown up sections. This was seen at over 50% of the posts on that field. The tape is also showing signs of being over tensioned where the wires have been pulled apart by over 50mm (2 inches). 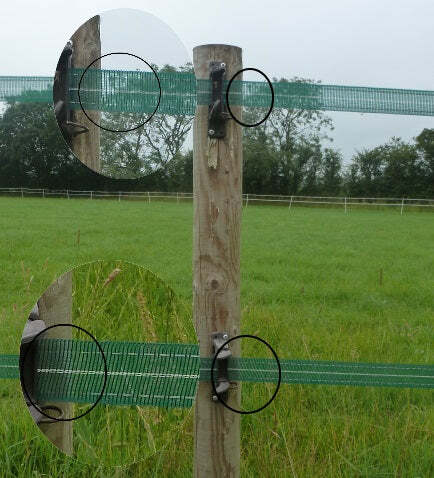 As soon as these breaks in the tape conductor happen, the electric fence is compromised. The physical structure of the weave presents a further problem in that the fine metal filaments woven into the electric fencing tape are placed parallel to each other across the width of the tape. The result of this is when one filament breaks it is no longer carrying current so proportionally reducing the conductivity of the electric fence by the number of filaments in the tape. This naturally reduces the effectiveness of the fence as a whole. A further issue presents itself when constructing the fence. As mentioned above, in an attempt to reduce the flapping of the tape the fence is invariably pulled up too tight and over-tensioned. The bulk of the strength of the tape is supplied by the plastic threads but these WILL stretch under a load whilst the thin metal filaments WILL NOT stretch. As a result these filaments are frequently broken in the initial erection phase of the fence. When this taut fence is subjected to additional pressure by the wind, the plastic will stretch further but the filaments will not resulting in them breaking and compromising the effectiveness of the fence. With the reduction in the filament numbers, the resistance in the conductor increases at that point so that when the fence is subjected to a strong energiser arcing may occur and the plastic strands show as being burnt with the tape being further compromised. The biggest enemy to plastic is the Ultra Violet rays in sunlight. These cause the plastic to become hard and brittle and the large surface area exposed to sunlight by the flat nature of the product presents an obvious problem resulting in a reduced life of the product. This may be mitigated by the inclusion of UV stabilizers such as benzophenones but this naturally increases the price of the product. As a direct result of these added compounds and the manufacturing difficulty tapes are more expensive than any other comparable product. A rope has the majority of the plastic strands hidden within the circular construction and the surface area open to sunlight is far lower. A rope presents a more streamlined surface to the wind so is less affected by wind. The insulator required for a tape fence is bigger than a rope fence and contains more plastic - consequently more expensive. 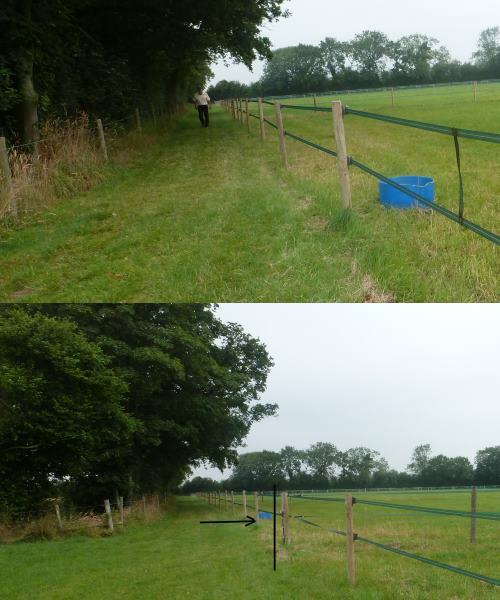 A tape fence usually incorporates more posts within the fence to mitigate the flapping effect so again driving up the overall cost of the fence.